Once the domain of the world’s militaries, a new breed of drones have taken flight and are being raced in competitions around the world such as Korea’s GiGA Drone Race in Seoul last year, the World Drone Prix 2016 in Dubai and upcoming Drone Worlds world championship races in Hawaii this October. These high-performance racing drones are being created by the next wave of drone developers and are pushing the thresholds of robotics, aeronautical engineering, machine vision, battery technology, and human capability. The prizes for these competitions are rapidly climbing and the races are now being broadcast online via YouTube and TwitchTV and through traditional TV channels such as ESPN and the Discovery. Several big media, sporting and financial organizations are starting to stake claims into the fast-growing business. Some of these major players include the International Drone Racing Association, Drone Racing 1, the Drone Racing League, and the European Rotor Sports Association, all of which are racing to become the Federation Internationale de l’Automobile or Federation Internationale de Football Association of the drone-racing world. Drone racing or first-person view racing is the fastest growing competitive sport in history. It is an elegant blend of human skill, technological prowess, broadcast and content development capability, and is enjoyed by people all over the world. At present, millennials are the biggest demographic for drone racing. This, however, is quickly changing due to the breakneck growth of the sport. Social media, online streaming, and the rapid backing by traditional sports organizations and high-profile investors are fueling the phenomenal growth. Like e-sports, drone racing is heavily dependent on technology, but is a more recent phenomenon than its cyber cousin; appearing on the scene just a few years ago and then exploding in popularity over the past year. And alliances between several organizations are already forming. The Drone Sports Association will hold Drone Worlds, the 2016 World Drone Racing Championships, in Hawaii this Oct.17-22. The event will feature some of the world’s top talent and state-of-the-art technologies and will be broadcast on ESPN. The Los Angeles-based DR1 recently partnered with TwitchTV, the Discovery Channel, and ESPN to bring us the DR1 Invitational, which is being broadcast on the respective channels. The WWP, one of Europe’s largest independent sports marketing companies, recently formed an alliance with the Drone Champions League to build a breathtaking course called The Race in Ruins in the Austrian Alps at Schlosskopf Ehrenberg. Earlier this year, the DRL kicked off its inaugural season -- a series of races held in several venues such as the Sun Life Stadium in Miami, and the abandoned Hawthorne Plaza mall in Los Angeles. The opportunities in this fast-growing culture are limitless for those who know how to position themselves and participate in this fast emerging market. In Korea, several organizations are already getting behind the drone-racing game, which bodes well for their business outlook. These forward-looking companies are building the technologies, infrastructure, and forming professional teams to secure their respective positions in the developing global drone-racing ecosystem. Many nations already have government and corporate initiatives in place to develop drone racing courses and events so that they can capitalize on this growing opportunity. Being an early mover in the drone racing business is, as in most any endeavor, crucial in order to establish oneself as a leader in terms of competency and brand. Korea would benefit immensely by having the private and public sectors join forces to build a world-class drone racing course and park. By doing so, the country could take advantage of its technological prowess, stimulate economically underdeveloped regions, develop next-generation businesses in technology and services, create employment, boost international tourism, elevate the “Made in Korea” brand, and grow its cultural exports. And as fate would have it, the upcoming Winter Olympics in Pyeongchang provides Korea an once-in-a-lifetime opportunity to promote and secure a place as a leader in the fastest-growing sport of the 21st century. The timing is perfect to take advantage of the huge marketing halo effect from the massive influx of foreign visitors and the global media coverage that will take place. In Korea there is no shortage of technological capability and there is a need to find growth engines to stimulate regional economies where unemployment and economic stagnation are endemic; tackle growing youth unemployment; establish more content and broadcast businesses to accelerate the hallyu momentum; take Korea’s innovation image on the global stage to new heights; boost domestic and international tourism; elevate Korean brands; attract foreign investment thanks to the favorable image created by being cutting edge and developing innovative next-generation technologies; and give rise to all-new industries through this virtuous cycle. In terms of stimulating regional economic development, the creation of a world-class drone racing course and park would bring far greater benefits than any previous effort to stimulate regional economies, as this is already a rapidly expanding business enjoyed by a growing number of spectators and pilots around the world as it combines technology, entertainment, and culture. Not only will it draw tourists, but through the viewing of events and the region, it will promote the region at no cost to the provincial government as costs would be absorbed by advertisers and other market participants. The creation of the park would require workers for the construction, operation, promotion, and ongoing technological development. Jobs would be created in the region during the construction phase, and then even more jobs will be created afterwards because the operation and maintenance of the course and park would require a full-time staff. The higher volume of tourism would need an educated workforce to assist domestic and international visitors, broadcasting and content creation would require skilled employees and there would also be a need for people to work in the surrounding businesses that support the course. The drone racing course and park would further benefit the public through increased tax inflows. As for the private sector, IT, broadcasting, construction, defense, education, chemicals, and food and beverage are but a few of the industries that stand to gain. Going forward, the accumulated know-how of the experts that are created by this project will enable them to provide products, services and expertise to other countries’ drone course endeavors. The bottom line: the stars are in alignment for Korea to capitalize on the most exciting sports business opportunity of the 21st century. Doing so would economically and culturally benefit the nation. It would create jobs and fuel interest from international fans, shining a light on Korea’s ability to lead the fastest-growing sport of the 21st century. It would push the envelope of technological development in industries that are of strategic interest to the nation. Growth areas such as autonomous driving, aeronautical engineering, artificial intelligence, streaming media, machine vision, batteries, electric motors and many others would be driven to previously unimaginable heights -- pardon the pun -- as these races push the limits of human capability. The Korean government can make this happen by partnering with drone developers and related industries. It all starts with a conversation. Let’s talk about the future now. 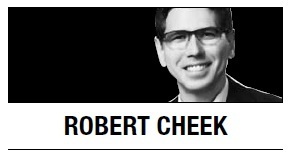 Robert (Robb the Robot Guy) Cheek is the robotics analyst for HMC Investment Securities, the investment-banking arm of the Hyundai Motor Group. He can be reached at r.cheek@hmcib.com. -- Ed.